and Kentucky raptor rehabilitator Eileen Wicker and her staff at the Raptor Rehabilitation of Kentucky. In addition to the wing fracture, Big Bertha was successfully cured of Asper, a disease or fungus in the air sacs of her lungs. When Big Bertha was removed from her cage at 11:30 a.m. after a four hour drive from the rehabilitation center, she flew beautifully across the field where she had been initially rescued by Kentucky Conservation Officer Sgt. Ron Haywood, U.S. Fish and Wildlife Service Special Agent Gene Moore, City of Princeton Animal Control Officer Kristen Watson, and Jerry Farless who reported the injured bird in February. After flying approximately 800 yards, she rested until about 1 p.m. and then took flight again, circling the area at approximately 200to 300 feet. Big Bertha was last seen flying toward the U.S. Forest Service’s Land Between the Lakes (LBL) where several known bald eagle nests are located. 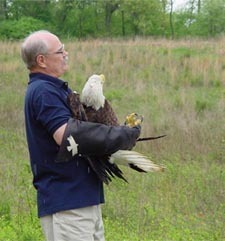 During the 1970’s and early 1980’s LBL was a pioneer site for the re-introduction of endangered bald eagles into the Southeastern United States through the technique of “hacking” which uses man-made nests and feeding disguised as wild parenting to raise and release captive bred eagle chicks in a natural manner. Big Bertha may have been a descendant of those hacked birds. Twenty three people attended the ceremony to release Big Bertha and to honor the late Marlys Bulander, a U.S. Fish and Wildlife Service employee who dedicated 36 years to educating the public and rehabilitators about proper care for injured birds. Mrs. Bulander worked in the Fort Snelling, Minnesota (Great Lakes – Big Rivers Region) Migratory Bird Permit Office and recently lost a two-year battle with cancer. The U.S. Fish and Wildlife Service is the principal federal agency responsible for conserving, protecting and enhancing fish, wildlife and plants and their habitats for the continuing benefit of the American people. The Service manages the 95-million-acre National Wildlife Refuge System, which encompasses 544 national wildlife refuges, thousands of small wetlands and other special management areas. It also operates 69 national fish hatcheries, 63 Fish and Wildlife Management offices and 81 ecological services field stations. The agency enforces federal wildlife laws, administers the Endangered Species Act, manages migratory bird populations, restores nationally significant fisheries, conserves and restores wildlife habitat such as wetlands, and helps foreign governments with their conservation efforts. It also oversees the Federal Assistance program, which distributes hundreds of millions of dollars in excise taxes on fishing and hunting equipment to state fish and wildlife agencies.